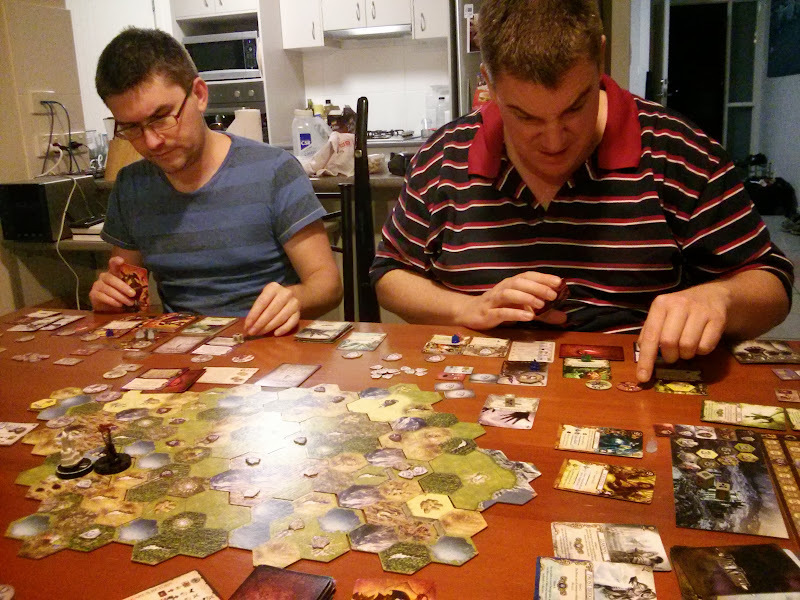 I haven’t yet written about a game of Mage Knight I played a few weeks ago. I received the expansion, The Lost Legion, for Christmas, and had some friends over during the break. I was able to convince them to play – even though I warned them it would probably take all day. As it turns out, that was a conservative estimate. In an attempt to alienate both camps, I hope to write this in such a way that those who have not played before can keep up, and those that are experienced can treat it as an after-action report. We selected our four mage knights. We were co-operating, in this scenario, against General Volkare and his massive army. 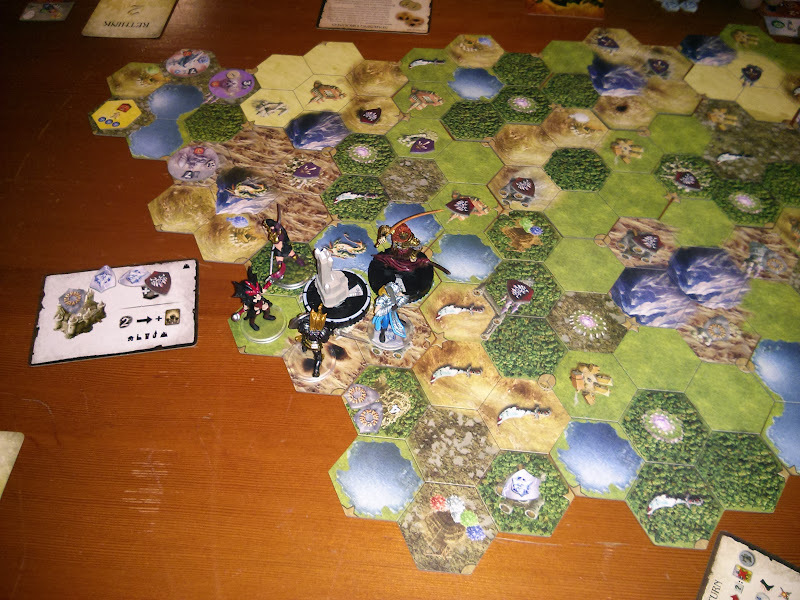 Both the general and the mage knights were looking for the capital city. We had to find it first, conquer it before he gets there, then defend it against his army. Trust me. It’s a daunting task. Our epic journey began at 11am, after a late breakfast. 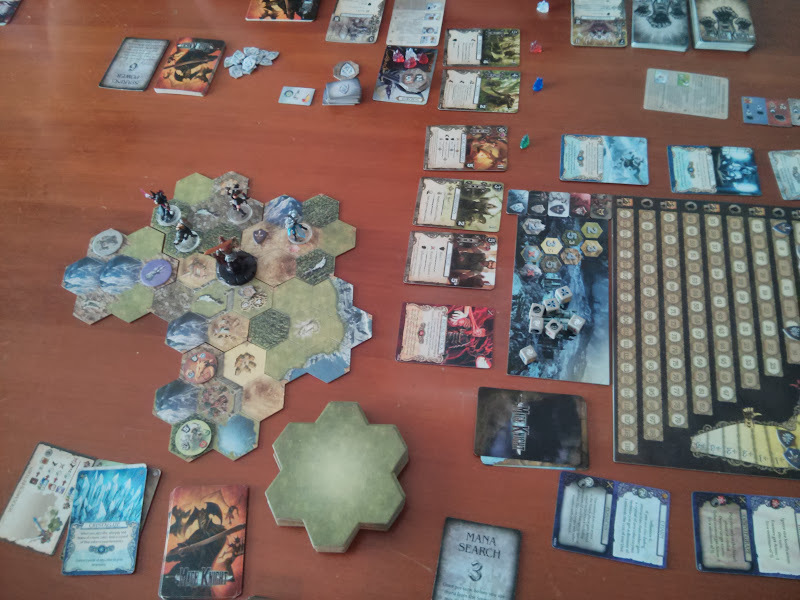 Two of our players were new, but as I’ve said before Mage Knight is actually a very easy game to teach. I explained things as we went along and so set-up took much longer than initial explanation. Things were humming along well, and the hours flew by. This is an incredibly long game, but you just don’t notice the time. Opening a Mage Knight box is a dangerous prospect. The lid clings desperately to the box, trying to contain that which is within. As the lid comes free you will hear a slight rush of air, as time itself is drawn in. You probably think this a myth, to scare the foolish from the treasures contained inside. When you play it – you will see, oh yes, you will see. On the first night, Volkare attacked one of us. At the end of the game, after 3 days and nights, and we are high level and all four of us are working together, we expect to have a very difficult battle with Volkare. Trying to stand up to him by yourself on the first night is unheard of. And so they ran taking a few wounds for their trouble. We proceeded as slowly as we dared. We wanted to explore every tomb, tower, and ruins but we also needed to make sure we moved fast enough that we would find the city before Volkare, and before his deck ran dry – if it did, he would rage and would be impossible to beat. Our slower pace meant he was able to recruit new followers to his army, but this is a trade-off we’d agreed to as our strategy. My character was destroying her reputation in favour of more personal power. She burned monasteries for their artifacts (after intimidating them into teaching her a new trick), hired thugs who are actually more likely to follow a character with a poor reputation, and cajoled others to follow with magic. We stopped for dinner and one player had to work a short shift. This gave us a break of 3-4 hours. We were just starting the 3rd day, and had just found the city. We were a pretty well equipped, but time was running short. We had to take the city as soon as possible, then brace for Volkare who would be arriving very shortly afterwards. The original plan entailed taking the city at the end of the 3rd day, so we could fight Volkare during the final night… but we hit a problem. Two mage knights approached from the west, and were effectively waiting for myself and Wolfhawk to rush back from the east. Unfortunately we were cut off by two dragons. One was a red and while challenging, he was beatable… if only I had got the right draw (and I did not). The other was a new summoner dragon who, with both physical resistance and arcane immunity, just couldn’t be harmed by Wolfhawk. I had just brought the powerful Altem Mages under my control (magic coercion of course), and they had the power to single-handedly dispatch that dragon – but I was blocked by the red who wouldn’t let me pass. I discarded cards frantically while Volkare closed on the city in an attempt to get a winning combination on the red. It cost me a lot of resources, and I took a good handful of wounds, but I managed to dispatch the red. 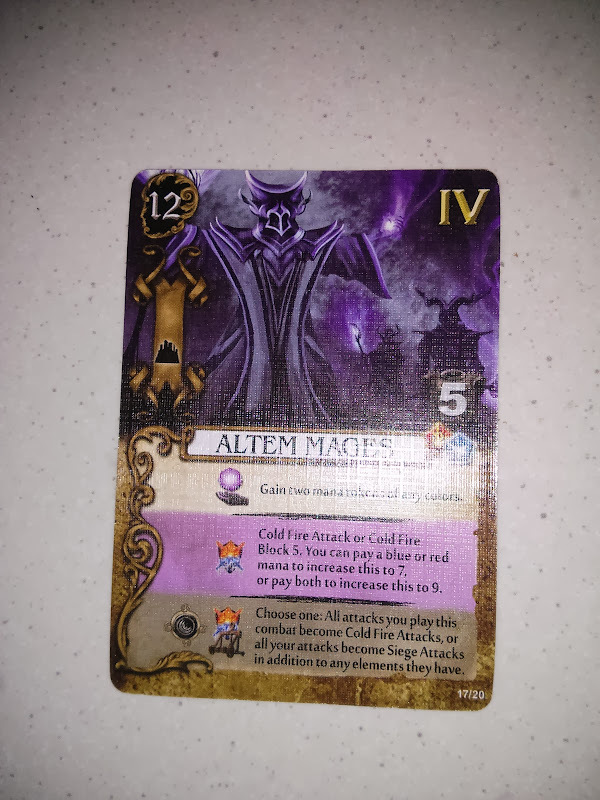 I moved up to the dragon summoner and, in what was ultimately a pretty anti-climactic end for a unit that seemed indestructible, my Altem Mages dispatched him with a wave of a hand. This badly delayed our city assault, but now all four of us were prepared. We launched a four-way attack, and although most of us defeated our opponents, Wolfhawk had to leave one alive, and the strongest enemy defender (Altem Mages except this time defending against us) also survived. 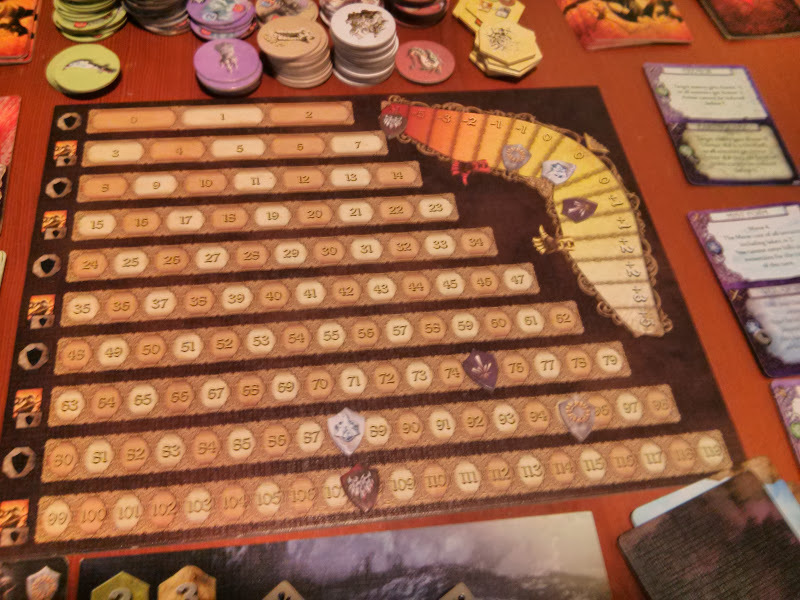 We were forced to wait until the first turn, of the final night to take the city. After re-drawing a hand of cards ready for the start of the final night, I decided I had enough power to take the final two defenders myself. I did so, in a large part because my Altem Mages were able to dispatch one powerful opponent with nary a thought. This meant they were unfortunately spent for the upcoming battles with Volkare. The can destroy a single opponent, sure, but they also have the power to turn every one of my attacks into the most powerful forces of destruction in the game. If had that, anything I attack would surely die – before it even had a chance to attack. Volkare soon arrived. We counted up his army and divided the foes. Some of us felt we could better-handle the more dangerous white and red elite enemies, so we divvied up a few extras to Mage Knights Norowas and Tovak. Without the Altem Mages to help me, I wasn’t sure I could comfortably handle too many elites, but opted for a couple extra orcs and soldiers. I did have an ace up my sleeve, though. For what turns we’d been able to prepare, before Volkare’s arrival, I had been saving up my strength with a tactic called Sparing Power. This allowed me to put an extra card away each turn, and then take all these saved cards into hand at the start of a later turn. This allowed me to have many more cards than my normal hand limit in preparation for the attack. We flipped over our enemies so we knew what we faced, and simultaneously calculated and organized our tactics. 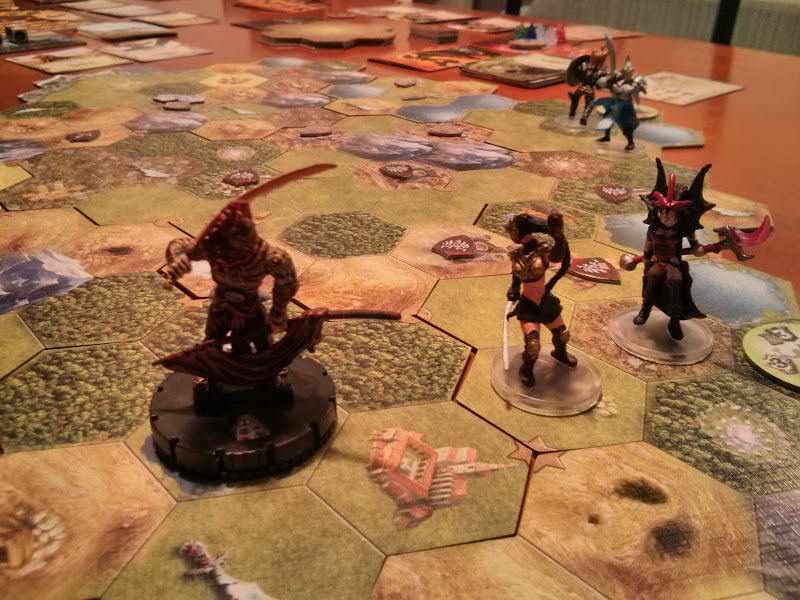 In a typical game of Mage Knight you usually fight one enemy. Sometimes you might fight two. At the climax of the game, you may be forced to face three. In this battle, I was facing nine. One by one we announced we’d finished our attack. You really need to then call another person over to check your working, because the battles get that complex. As I said, I had many cards over my normal hand-limit. The first thing I did was break my ring artifact – this gave me unlimited green and black mana. Green mana tends to be of the domain of nature, and healing. Black is the rare, powerful mana needed to augment the most powerful spells. I also had an advanced action that allowed me to cast a spell I could see on the table, but didn’t actually have in my hand. I used this, with my unlimited mana, to cast a mighty earthquake, lowering all my opponents armour (effectively hitpoints.) In many cases this lowered them all the way to 1. Next, I had to mount a defense, blocking what I could. I shot a few of the weaker enemies with arrows and I threw my thugs and other followers suicidally into the path of my enemies (by this stage, my reputation was so bad I was actually barred from interacting with NPCs :/) I still took a huge number of wounds, nearly stunning me, but that’s all I needed. My counter attack consisted of just one card. Flame Wave. Cast using my unlimited black mana (and a dash of red I’d been saving.) It starts out powerful enough: Fire Attack 5. But it is increased by 2 for every enemy you face, for a total of… Fire Attack 21. With enemies already softened up with an earthquake, that single wave of fire wiped out Volkare’s entire flank. In the end, everyone had done well. Tovak had to let one elite enemy get away, Norowas had to let one minor enemy slip through his fingers, and Wolfhawk couldn’t quite kill one of his either. Volkare’s army of about 34 was reduced to 3. Yes, our hands were greatly depleted, but even so at least two of us were able to comfortably dispatch these final enemies, and Volkare was defeated. We were elated. We looked around. It was 2.30am. For those that couldn’t be bothered with the maths, that’s 15-and-a-half hours, minus a 3-4 hours for dinner. We’ll just call it an even 12-hour game. Aw, you’d be FINE. 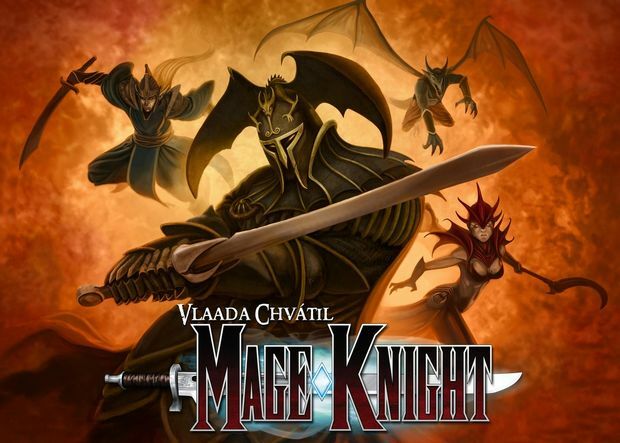 You don’t have to start with something as complicated as Mage Knight (which is also one of the best games out there). You could go with something quicker and simpler like 7 wonders, or if you want a co-op adventure game experience, Descent.